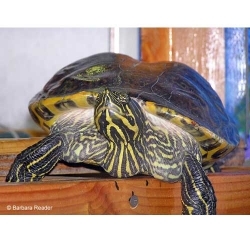 Timmy is a 46 year old male River Cooter owned by Barbara Reader in New York. Barbara got Timmy when she was four years old and Timmy was a hatchling. Timmy is believed to be one of the oldest living River Cooters in the world. Turtles, Volume 4: Timmy the Turtle contains 35 photographs of Timmy the Turtle, by Barbara Reader.